Wireless foldable mouse, streamlined design, can ease the fatigue of holding the mouse for a long time. Get rid of the cable shackles and enjoy wireless pleasure. With super stable sensitivity, you&apos;ll be absolutely satisfied. 1000DPI highly sensitive, accurate and rapid transmission, providing more accurate control. Get rid of cable ties and be smart and portable. This mouse is your best companion at work or business. 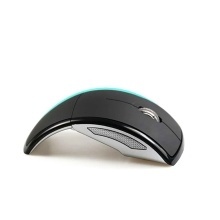 Streamlined design to ease the fatigue of holding a mouse for a long time. 2.4GHz wireless technology, enjoy a portable new era. Nano extremely tiny receiver, plug and play.